Avner has collaborated with many artists in devising, revising, developing, and directing shows. 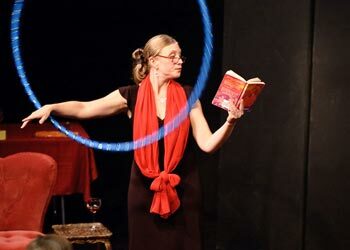 Hilary Chaplain — Hilary’s innovative one woman show, A Life in Her Day, tours worldwide. Julie Goell — Julie is a brilliant artist, hilarious comedian, and a lyrical singer. Her one-woman version of Carmen, seen from the point of view of the cleaning lady at the opera, creates a new genre, the moperetta. This show was conceived, and originally directed by Mark Ross, a longtime collaborator of Avner and Julie’s. Mandy Huotari — You're in good hands with Elizabeth, a charming and witty hostess who, despite pretensions, is contagiously optimistic. A “bon vivant” she never lets a glass get empty. However, tonight is full of surprises and by pouring herself “just a splash” at a time, Elizabeth spills it all. This is one party you won't want to miss. Written and performed by Amanda Huotari. Directed by Avner Eisenberg. Drew Richardson — (foolish theater for smart audiences). Drew’s one man show, Help! Help! I Know This Title is Long, But Somebody’s Trying to Kill Me! is charming and amazing. Danny Schlesinger — Directorial collaboration on Danny’s enchanting show, Lighter than Air. Rob Torres — Rob creates a whole world with a piece of string and a roll of masking tape in No Place Like Home. Rob has been to three Eccentric Performing workshops, where his show was conceived, developed, and polished. Rafael van Herck — Rafael is a multi-talented performer who is equally comfortable in English, Flemmish, and French. He has performed his charming blend of magic, comedy and horror worldwide. What a pleasure it has been to watch Rafael grow as an artist over the years, and an honor to have had some small influence. Iman Lizarazu— Iman is a charming and inventive performer from the Basque region of France. She is a long time student of Eccentric Performing. Her one-woman show, Commedia Della Basque, directed by my wife and partner, Julie Goell, is the comic tale of an insomniac who battles for the embrace of Morpheus. See her new promo video here.